Rosh Hashana and Yom Kippur Now Available ! 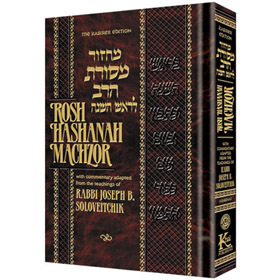 The Hebrew Text of the Machzor, as well as the translation and instructions, is from the universally acclaimed ArtScroll Rosh Hashana & Yom Kippur Machzor. The Annual Teshuvah Shiurim of Rav Joseph B. Soloveitchik zt”l were transforming moments for all who heard them. His penetrating insights, brilliant erudition and fully expounded sense of awe of the Y’mei HaDin, enabled everyone to gain a deeper appreciation of both the magnitude of the task of repentance and the path toward personal and communal growth. This work presents many of the probing thoughts offered by the Rav in his shiurim, lectures and written works — distilled for the very first time into a concise commentary on the tefillos of the day. This Machzor will add meaning and significance to your prayers on Rosh Hashanah or Yom Kippur and and its messages will continue to inspire you throughout the year.